In an ecosystem, all living things rely on each other and work together to be healthy; but, some species are crucial to the way all the species interrelate. When a keystone species is removed from a habitat, the habitat is dramatically changed. All other species are affected and some may disappear from that ecosystem or even become extinct. American alligator: Alligators use their tails to make burrows to stay warm and when they move on, these burrows fill with water which is used by other species. 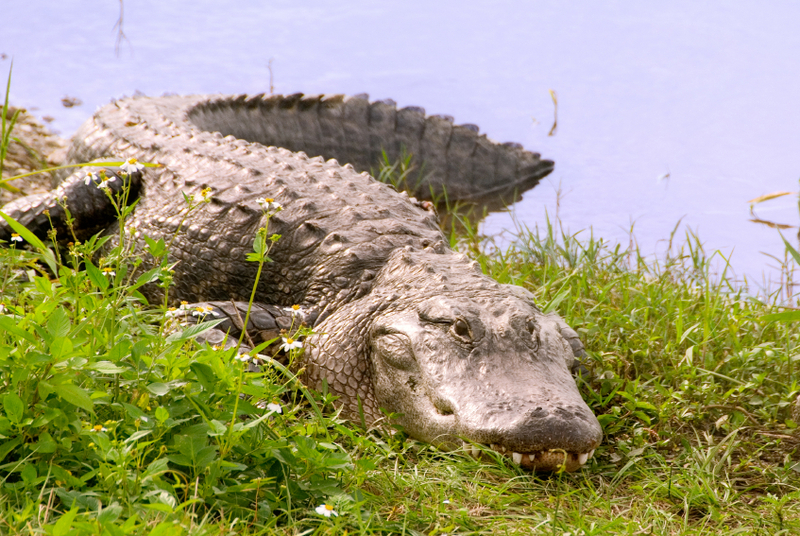 Alligators are also predators, keeping the numbers of other species in check. Beavers: Beavers are considered habitat engineers because they change the environment by building dams. This dam building provides still water in which many species flourish. Bees: By pollinating plants, bees contribute to their survival. The plants are shelter for insects, which are then eaten by other species, like birds. Elephants: By eating small trees, elephants preserve the grasslands, because the grasses need plenty of sun to survive. If they were not there, the savanna would convert to a forest or scrublands. Gopher tortoise: This tortoise makes large burrows which are used by more than 350 species, including owls, snakes and frogs. Grizzly bears: As predators, bears keep down the numbers of several species, like moose and elk. They also carry and deposit seeds throughout the ecosystem. Bears that eat salmon will leave their dropping and the partially eaten remains that provide nutrients such as sulfur, nitrogen and carbon to the soil. Hummingbirds: Pollination is the reason hummingbirds are a keystone species. In places where the numbers of hummingbirds are low, other species of plants will take over the ecosystem. Ivory tree coral: 300 invertebrate species call this coral home. It is here that fish live, breed and become food for larger fish. Jaguars: Jaguars are predators, as are many keystone species. They have a very diverse diet of about 87 different species, which contributes to their importance by keeping the numbers of these species in balance. Mountain Lions: These predators cover large areas and influence many species. Their prey will alter where they eat and live because of the mountain lion. Scavengers are also affected by the mountain lion's activity. Pacific salmon: Salmon die after spawning and this brings important nutrients to the place where they were born. Their death provides food for many species in the area. Prairie dogs: By eating grass, prairie dogs keep water in the soil instead of the water evaporating from the leaves of plants. By tunneling, they help channel rainwater into the water table. By burrowing, they mix different layers of soil, combine it with their droppings, and aerate the soil. Red mangrove: This tree grows along the shoreline in the tropics and its roots protect the soil from erosion. The roots also offer protection to small animals, including reef fish. Sea otters: Sea otters are a keystone species in the kelp forests. They eat many invertebrates, but especially sea urchins. If there are too many sea urchins, they will eat too much of the kelp and destroy it. Sea stars: Sea stars eat mussels and keep their numbers in check. Too many mussels will crowd out other species, and since mussels have no other natural predators, sea stars are invaluable for keeping the ecosystem diverse. Snow geese: If there are not enough snow geese in salt marshes, other harmful species will take over. When the geese graze, it leaves open areas for other varieties of plants to take root, thus adding to the diversity of the habitat. Spruce budworm: This is a moth that lives in conifer forests. As the population of budworms increases, more small animals and birds move into the area to eat the larvae. This will cause some trees to die, but they will be replaced by younger trees, and the cycle will begin again. Sugar maple: This tree is a keystone species of the hardwood forest. It brings water from lower levels in the ground that helps other plants. It is also home to many insects, birds, and small animals. Tiger sharks: These sharks will eat practically anything. This helps control populations of sea turtles and dugongs who may cause overgrazing of the sea grass in Western Australia. Since sea grass is where fish lay their eggs, overgrazing would lead to fewer fish. Wolves: Being a top predator, wolves are important in many habitats. Wolves keep deer populations in check and too many deer will eat small trees, which leads to fewer trees. In turn, there would be fewer birds and beavers and the whole ecosystem would change. As you see, keystone species are very important factors to control the ecosystem within their habitat. "Examples of Keystone Species." YourDictionary, n.d. Web. 18 April 2019. <https://examples.yourdictionary.com/examples-of-keystone-species.html>.